The remarkably negative reaction to Lucinda Creighton's new political initiative suggests that the Irish welcome change, so long as nothing changes. What caused such a negative reaction? It was hardly the four platforms, carefully designed to offend no one. Though perhaps that's the problem. 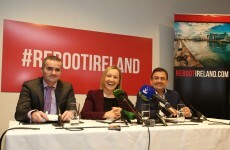 Sure, Reboot Ireland's use of 'PC language' is a bit dated (God knows most Microsoft Windows users understand 'reboot', but the average smartphone user?). The task of those advocating policies for change is to 'move' the Overton Window up from Unthinkable and Radical to Acceptable then Sensible and ultimately into Policy. The concept applies both to social and cultural issues (abortion, gay marriage) and to economic issues (minimum wages, water charges). 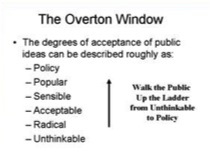 Of course, political activists will want to move the Overton Window to make their ideas sensible and popular in the hearts and minds of the electorate. But the political mainstream is formed around what is already popular (and policy) and so those with radical or unthinkable policy ideas have a job to do. The problem is, the gravitational pull of the Overton Window makes it hard for new political parties to distinguish themselves from existing parties if they start advocating policies that are already mainstream. This fate appears to be befalling Ukip, who - according to Nick Wood - are now sounding just like the rest of the LibLabCon PC-consensus (and that's not the Windows version). It sometimes works in reverse (e.g. : Thatcherism in the UK, which threatened to dismantle the Welfare State but ended up dismembering the unions instead). Nevertheless, most of the time the Overton Window moves Left rather than Right (clearly in the case of social policies and increasingly in the case of economics policies - ask a deposit holder in Cyprus if you don't believe me). The problem for Reboot Ireland is that it is starting firmly within the Overton Window (even Lucinda's admission that she favours gay marriage places her firmly in the 'Acceptable/Sensible' consensus camp). Hence some of the negativity - there isn't a big demand for 'more of the same' right now. Maybe what Ireland really needs is its own Russell Brand. Someone who can appeal to that fast growing constituency - the politically ignorant - who can be easily persuaded by the next celebrity with a soundbite. The Overton Window has become the Overton Tweet. So true, Gerard. What the 'rebooters' have failed to grasp is that voters who are socially conservative are not necessarily economically liberal. Eddie Hobbs isn't going to gladden the hearts of people whose main interest in voting for the new party was its apparently principled stand on issues of conscience, not their tax policies. Likewise, Ms Creighton's shift to the liberal left on social issues in search of votes will not be deemed credible by those who are already suspicious of her, and just alienates those who thought they could trust her to stay true to her beliefs. A sorry sight, I'm afraid.